3/8 Friday, 1208.8, 65/45, partly sunny, SW10-15 - The evening was calm and perfect for sleeping. 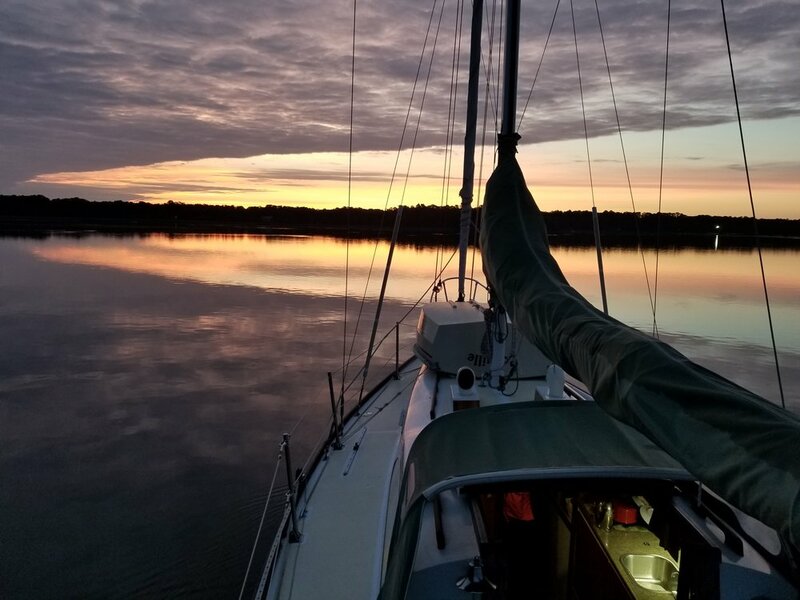 We were greeted by a brilliant sunrise and hauled up anchor shortly after, eager to get to Skull Creek Marina and borrow the car to re-provision. Dobbs again dropped Murph and me off at Daufuskie Landing for a walk. Then we motored north, up Calibogue Sound, in calm. Grace was in a slip by 10:30am. The marina staff and dock neighbors we’d met previously gave us a warm welcome. In a 2-1/2 hour shopping whirlwind, we stopped at the Post Office to purchase and then mail a money order for job parts we’d purchased on credit; returned a number of leftover unused parts to West Marine; and bought two weeks’ worth of groceries at Walmart. In the afternoon, we stowed our goods, Dobbs spliced line for tomorrow’s rigging work, and I washed two loads of laundry. As I was waiting for the last load to finish, at 4pm, I called my Mom to see if she was feeling better. Without going into details, she’d had an accident last weekend but refused medical attention. Her condition has been worsening daily but my brother and I have been honoring her choice to stay home. It’s not easy to witness, but she’s of sound mind, so it’s still her right, and not ours, to make decisions about her healthcare. Tonight, she sounded awful - tired, ragged, played-out, and suffering. We talked a little, just to make conversation, politely trying to ignore the obvious. I told her I could get her help in minutes if she wanted it - she declined. I asked her if she was where she wanted to be, at home, and she firmly said she was. I had a terrible feeling death was near. She said she was tired and wanted to get back to resting, that sleep was best. I told her I loved her, and she replied “I love you too, Baby” (I’m the youngest by 20 years). She’s such a strong woman - I’d never heard her like this, and it broke my heart. It was our last conversation. Mrs. Patricia A. Neyhard - my mother, my friend - died that night or the next day, in her home, on her terms; 86 years of feisty spirit and iron will. I’m proud to be her daughter and grateful for the 42 years we shared. Dobbs and I will be leaving Grace in Hilton Head as we drive north in a rental car, home to spend a week with my family as we mourn, honor, and bury Mom.